I know it's early...but I was really inspired by this beautiful wreath digital image by Meljen's Designs. To jazz it up a bit more, the ribbon is colored with a silver Wink of Stella pen and I added leaf brads from Eyelet Outlet to the wreath. The dimension on the wreath is spectacular in person! I used an embossing folder on my background paper and then die cut a circle so that my wreath image would be inset into the background. 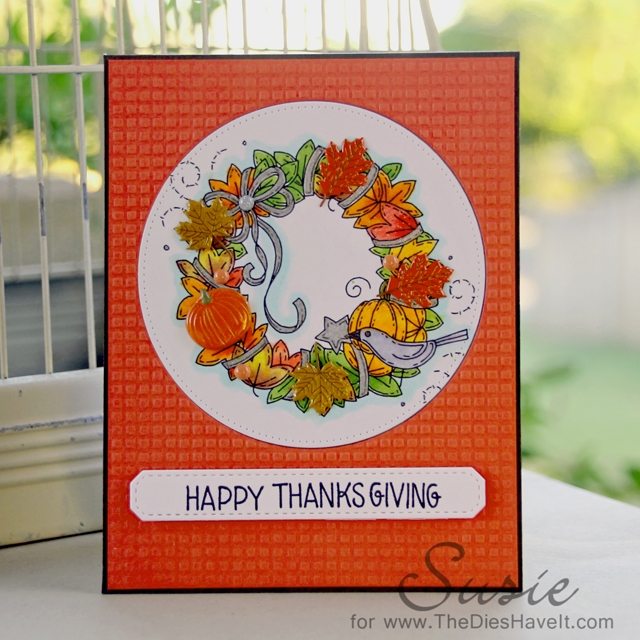 I hope you like today's bright Thanksgiving card. I'll be back tomorrow with a new project to share with you. Wish I had your talents! I love seeing all your cards.